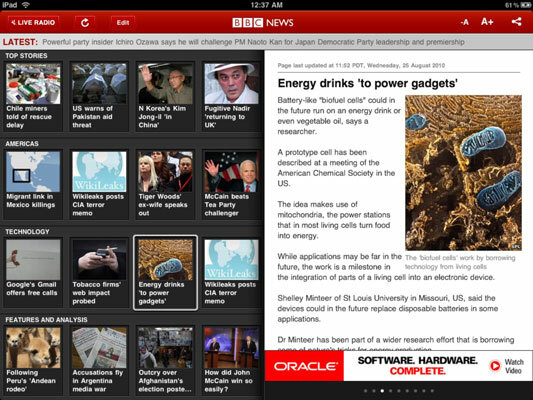 You can get the news right on your iPad by using any (or all!) of these apps. iPad has apps for hard-hitting news, traditional paper publications, and RSS feeds, so you can keep track of what’s going on in your neighborhood and around the world. The BBC organization generates written news, broadcast news, and one of the most-listened-to radio news programs on the planet (it’s broadcast all over the world, after all), and the BBC News app offers this content in a user-friendly way. When you launch BBC News, it takes a couple of moments to download all the recent content. That content is presented in several different categories, each with its own row of scrollable boxes that represents an individual story. Tap a box to make the story appear on the right, as you can see in this figure. Another great feature is the Live Radio button in the top-left corner of the screen. Tap this button any time and you get a live stream of current BBC News programming. Flipboard builds itself as a social magazine. It’s partly an RSS news reader and partly a new way to view social networking content, a lot of which is news linked to by your friends. The flagship feature of Flipboard is to turn your RSS feeds — including your Facebook Wall and Twitter feed — into a magazine-like spread. No, seriously. Of course, Flipboard also supports some straight RSS news feeds, though the number is somewhat limited. Those feeds include a variety of commercial magazines, blogs, major media outlets, and individual RSS feeds of some famous people. 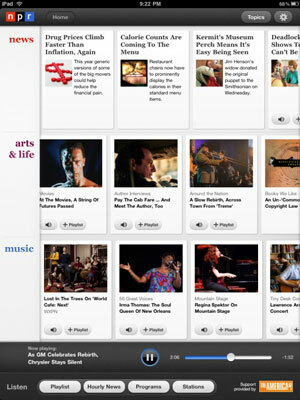 This app offers direct access to almost everything National Public Radio has to offer. Better yet, it has a great layout. 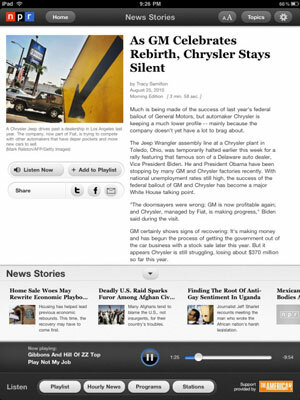 NPR for iPad offers up its content in several ways. Current stories are provided on the home screen of the app in three scrollable time lines. When you tap a story that interests you, it takes over the screen, with the category stream at the bottom. You can also browse NPR’s radio content by program. Not every show is represented, and not every program has full episodes, but most do. The key to Pulse News Reader is its main view. There are four rows of squares — each row represents a different RSS feed, and each square represents a different article in that feed, including any images. You swipe horizontally to browse through all your feeds, and you swipe vertically to browse through an individual feed. It’s slick, simple, and visually appealing, especially if your RSS feeds use attractive images. When you tap any particular article, all the other feeds disappear and the full RSS listing takes over the rest of the page. If you want to read more, you tap the headline or the Web button, activating the built-in browser, which pulls up the Web-based version of the full article. Wired magazine understands how to make a print magazine into a compelling digital offering. Wired has always been one of the best-looking magazines around, but on the iPad, it’s interactive, too! To start with, the app is a free download, but don’t let that fool you. Think of the app as a shell for multiple issues of the magazine. The app is free, but to get each issue, you have to make an in-app purchase. Fortunately, the publishers put together an iPad-only issue called iPad Edition Free Preview so that you can check it out. Another excellent feature for the iPad version are in-article videos. Try that in a print magazine! Just tap one of these videos that includes bonus content to open it in a full-screen player. Blogshelf presents RSS feeds as if they were magazines on a bookshelf. 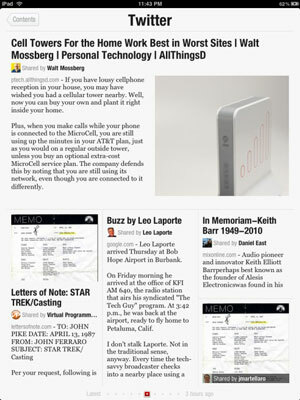 Tap a feed to see current articles presented in a nice, clean list form. Tap through to an article to see just the RSS content. 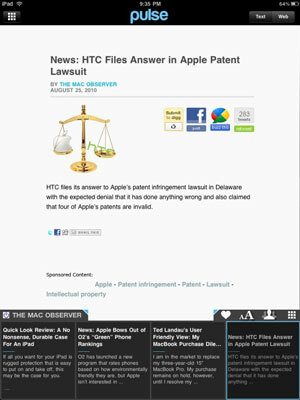 Tap through on the title, and you’re taken to the article’s full Web page in the in-app browser. You can mark favorites, e-mail or tweet an article, or swipe through to the next article. Casual RSS users looking for a low-key way to read their feeds might find this reader to their liking. 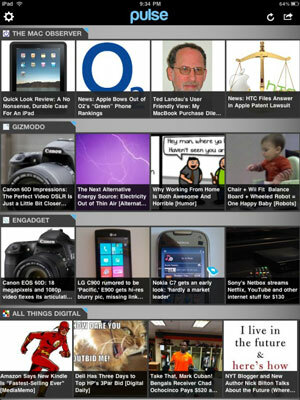 If you use Google Reader — the search giant’s free RSS news feed service — you’ll want this app. You can use it to browse your Google Reader news feeds by feed or by folder, manage starred items, and share stories through e-mail and Twitter. It uses a binder metaphor for browsing through your RSS feeds; all your controls are conveniently lined up on the left. USA Today is the national daily published by Gannett Company, and it was among the first newspapers to embrace the iPad. Navigation is good (tap the USA Today logo for quick section navigation), the layout is nice, and you get national and local news, sports scores, local weather, lots of photos, and the option to participate in a daily poll. Lastly, you can share articles via e-mail, Twitter, and Facebook. The Wall Street Journal is one of the world’s foremost business newspapers. 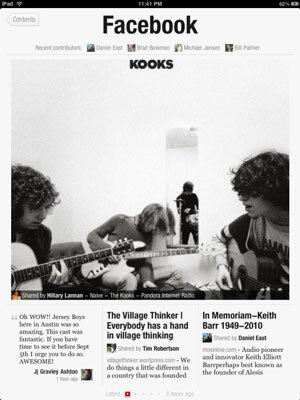 The Journal‘s iPad app is a must-have if you want to follow the newspaper on your iOS device. Navigation is simple, and it looks great, too. Zinio is a big outlet for magazines, and it also serves as a shell for multiple issues of each of those magazines. You can buy multiple magazines within the app. That said, therein lies a downside in the app: Not every digital edition of every magazine is a stellar example of great iPad design.